Traditional sod lawns are becoming a thing of the past due to rising water costs and the continued need for conservation. 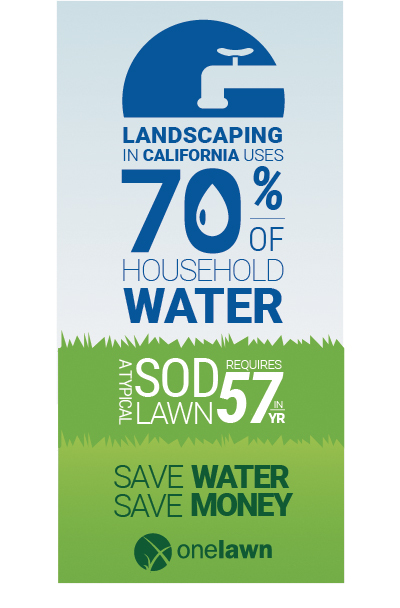 Did you know that landscaping accounts for almost 70% of the water Californians use at their homes? A typical sod lawn requires 57 inches of water a year – that’s over 1 inch per week. While some comes from rain, the rest has to be provided by irrigation. In fact, a small lawn of only 1,000 square feet uses an average of 55,000 gallons of water each year! If the lawn is overwatered, as many are (some sources say as many as 20-30% of lawns are over-irrigated – by up to 300%! ), then the total water usage for that small lawn can jump to 75,000 gallons per year. Although traditional sod lawns may be a thing of the past for Californians, an artificial lawn system by onelawn®allows residents to have a lush, green lawn that looks and feels like the real thing. onelawn® artificial lawns do not require any water, so you can have the look of a healthy lawn AND help your local community's water conservation efforts. It's a win-win.